“So she done it. And it was the n*****—I just expected it. She said the beautiful trip to England was most about spoiled for her; she didn’t know HOW she was ever going to be happy there, knowing the mother and the children warn’t ever going to see each other no more—and then busted out bitterer than ever, and flung up her hands” (Twain 167). Mary Jane is distraught when she learn about how slaves can be separated from their families when sold and is seen crying by Huck. The two of them are the only ones in the whole novel that sympathize with the slaves, and Huck is the only one who acts upon it. Today, this is seen not necessarily in the sense of slavery but in other contexts. For example, in schools today, bullying is a prominent issue. With bullying, there are kids who verbally, physically, or emotionally torment other kids, which can lead to depression, suicide, and anxiety. One of the problems isn’t with the bullies or victims themselves, it is the bystanders who watch it all happen. The bystanders can choose to do one of two things, keep on letting it happen, or do the right thing and stop the bully. 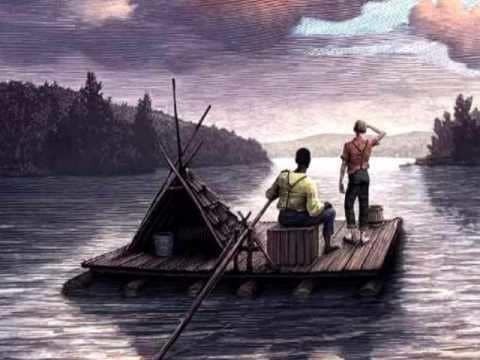 They have the choice to do what’s right or go with the flow, just like how Huckleberry Finn does in the book. Huckleberry Finn vs. Society by Sid is licensed under a Creative Commons Attribution-ShareAlike 4.0 International License. Sid- Great article! I loved how you introduced quotes into this. It really makes your argument stronger as well as really showing your audience how strong you feel about this issue. I think you could do a little bit more with the organization because you topic is a little all over the place at times and difficult to follow. Other than that I really believe you have some strong voice in this. Good job! Great job! I really enjoyed reading your essay and I thought you made some great points and raised important questions. I also liked how you compared the themes from the text to real world problems like bullying. Overall I think your essay is good although I would urge you to work on your organization and develop a conclusion. Wow, Sid I couldn’t agree more. I have had a very similar thought process about the societal struggles that are faced in the book. I also really like how you ask questions within your piece and it further my thinking and I really enjoyed it. Thanks for sharing your thinking!! !